Do you ever get the feeling your plants are trying to tell you something? 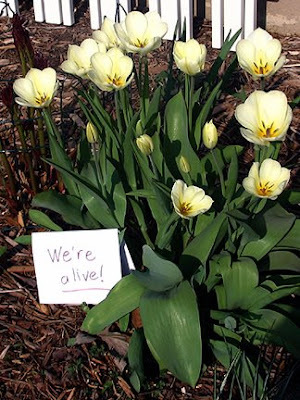 I feel so connected to my spring bulbs, it's almost like they're sending me messages by tulipathy. See what I mean? This is my only clump of glorious tulips (out of dozens) that will bloom this year. They were clearly rejoicing, smiling in the sunshine this afternoon, awaiting my return from Cincinnati. I was so happy to see them! In the backyard, another fate awaited the only other tulips that were intact when I left Sunday morning. They seemed to be telling me they are somewhat perturbed at the groundhog and, if they're honest, at me for not protecting them! Resolution reached: I have officially resolved to accept the situation and no longer plant tulips, sacrificing the ones that exist (except the yellow clump out front, please leave me that yellow clump!) without further bloom expectations. I'll instead add more hyacinths and daffodils for color next season. Details and photos of the Cincy Flower Show and Cox Arboretum will follow in a few days after I catch my breath, unpack, watch my Coronation Street omnibus, and, oh yeah, go to that windowless room where time spent is exchanged for money gained. Edit: I may have slightly modified the lyrics to Lene Lovich's "Telepathy" to get "Tulipathy." Allow me to apologize in advance. Great looking tulips! Too bad the groundhog got the other ones. I also started having them just in the front yard, where I haven't seen any squirrels yet and keep the daffodils mainly for the backyard. 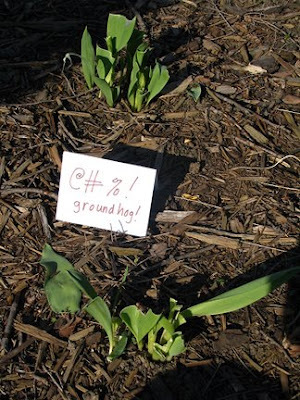 I have two tulip plants that have been chewed off in this manner, but don't believe we have groundhogs. Think it could be squirrels? Bek, I got most of my tulips from a friend who works as a horticulturist and had them left over... so losing them all (minus this lovely clump!) wasn't a financial loss, but an emotional one! :) I do love the pale yellow of these bulbs, which is odd because I generally like bolder colors. Kim and Victoria, In the previous entry, but in my particular case I know it's the groundhog based on a "trail of evidence" (chewed off leaves en route to a new hole). I do have a ton of squirrels and they may dig for bulbs in fall, but I've never seen one eat foliage. A more likely candidate would be a rabbit. I will looking more here on your blog. Many hugs and wishes from Niedersachsen. Ja, Birgit, ich wurde tatsaechlich in Buxtehude geboren, lebe aber seit ich 4 Jahre alt war in den USA. We gardeners always have to cope with Nature. there is nothing more soul destroying than having plants eaten by the wild creatures. Wuerden Sie gern ein Wohntausch in Vermont? I speak a fading German. I just saw you posted on Duplicitous Primates... a blog a share with a friend. Are you familiar with the composer Buxtehude? He was a baroque composer who was deeply admired by Bach. He was born in Buxtehude, I think. UpIn, actually the town of Buxtehude existed since about 950 and went by the name of Buxtehude since the 1300s. The composer Buxtehude was born in 1637, in Denmark. (You have to know these things about the city of your birth, you see.) I love Vermont, and haven't been there in way too long! If you care to spray for varmints, the product Liquid Fence works great, and it lasts for 30 days. The one drawback-it smells positively horrible! Luckily the odor fades quickly, barely noticeable by morning and gone within 24 hours. But the animals smell it, so they don't even taste your plants. It's the savior of my bulbs, for sure! Tulipathy...Monica, you crack me up!